Federal courts and shutdown: The sequester had already crippled American justice. The shutdown just shows how. Even before the shutdown, federal courts had already been crippled by the sequester. 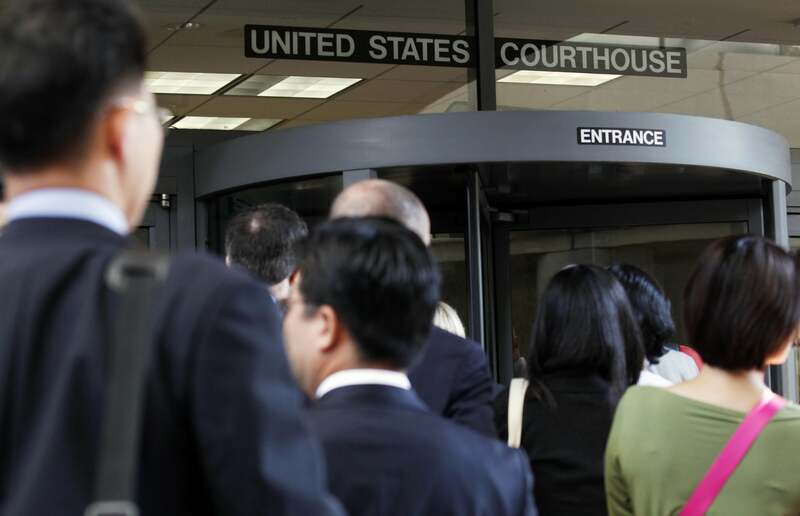 Spectators enter U.S. District Court in San Jose, Calif., to watch Apple and Samsung square off in a patent infringement case on July 30, 2012. The federal courts, already hampered by sequestration, will run out of money this week if funding is not restored. But don’t let the threat of an impending court shutdown alarm you. The federal government had crippled the courts already. The current crisis obscures the extent to which federal courts had already been operating on an unworkable shoestring budget. One of the great underreported outrages of the past year is the degree to which the judicial branch has been limping along on inadequate funds. Following sequestration last March, $350 million was stripped from the courts’ budget. The net result has been a disaster in the administration of justice in this country. This isn’t just about lofty ideas of “justice” or “fairness,” but about the raw costs to taxpayers, in public safety and in dollars. One estimate held that sequestration would force the judiciary to reduce its overall workforce by 5,400—roughly one-quarter of its total workforce—through layoffs or furloughs. Despite rising caseloads and judicial vacancies, the sequester set court staffing levels at their lowest level since 1999. Different federal courts have opted to make those mandatory cuts in different ways: Some have chipped away at their operating hours. Others have laid off marshals and security officers. Some federal courts are closed Fridays now. Security upgrades have been delayed. And even before the shutdown, thanks to all these cuts, there is significantly less security provided for dangerous offenders, and court budgets for drug testing and mental health screenings have been slashed. The sequester also led to an 8 percent cut in the federal defender offices around the country, leading to yet more delays in trials. As the Brennan Center cautioned in a July report, because criminal defendants are constitutionally entitled to counsel, firing their public defenders simply means taxpayers now bear the costs of their private attorneys. And don’t forget that when trials are delayed, prisoners languish in jail even longer, again at taxpayers’ expense. That same Brennan Center report found that lopping just one month off of each average prisoner’s incarceration would amount to about $260 million in savings a year. Whatever you may think of the federal judicial system, the problem of overcrowded prisons isn’t going away. The cuts hit us particularly hard because we are made up of people. That is what the judicial branch is. It is not like we are the Pentagon where you can slow up a particular procurement program or a lot of the other agencies. When we have sustained cuts that mean people have to be furloughed or worse and that has a more direct impact on the services that we can provide. Imploding the federal courts this week is also dangerous. Chief U.S. District Judge Ann Aiken recently explained that in Oregon’s federal court system there are 1,100 men and women—all of them former federal prisoners—living under the supervision of federal courts. Yet because marshals, public defenders, and support staff have been cut, they will not be properly supervised. Finally, the courts don’t get to pick their cases. Cases come to them. And the list of critically important litigation in which stays have been requested or delays granted range from a trial over the force-feeding of prisoners at Guantanamo Bay to a major Federal Trade Commission case to the terror trial of accused former al-Qaida spokesman Sulaiman Abu Ghaith, to a major Freedom of Information Act suit. Whether or not the courts are officially shuttered next week, the federal justice system is in deep and worsening trouble unless we correct for the mistakes of the past year. Things have become so dire, Senior U.S. District Judge Richard Kopf wrote on his blog last week, that “it is time to tell Congress to go to hell.” Pro tip? Judges don’t usually talk like that. It’s easy to say the federal judges and their clerks and secretaries and lawyers are just a bunch of pampered functionaries and that a court shutdown implicates little more than copier paper. But the federal court system is not just people—although real people are being hammered in the court system, as they are throughout the federal government. The problem is that these people are the country’s justice delivery system. And when their work is hampered, delayed, or impaired, it’s not just “trials” that grind to a halt. It’s justice. What happens in the courts may not be as compelling as what happens on the Panda Cam or as spiritually uplifting as the national parks, but our federal justice system is the embodiment of the rule of law, particularly at those moments when the wheels have come off the rest of the government.